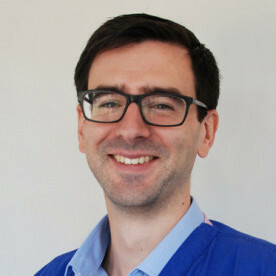 Michael qualified from the University of Glasgow in 2009 and then worked in first opinion practice in Buckinghamshire and Northern Ireland. He then returned to the University of Glasgow in 2012 to further his training and experience in oncology by completing four years of additional training. He completed an ECVIM residency in oncology in 2016 and became a Diplomate of the European College of Veterinary Internal Medicine and a European Specialist in Oncology in 2017. Michael worked at a private referral practice in Surrey prior to joining Fitzpatrick Referrals in 2018. In 2018, Michael was awarded a Masters degree in Veterinary Medicine. This additional qualification researched canine mast cell tumours. He is focused on promoting the best standards of veterinary care by helping others to fulfil their potential. Michael’s ongoing ambition is to develop the very best ways to minimise the impact that any form of cancer has on dogs and cats.